Last week I showed a picture of this new knife I got from Lamson & Goodnow’s “Lamsonsharp PRO” line. I’ve had a week to play with it now, so I can tell you what I think about it. First, I need to explain something about “Pro” tools: Usually if they have to tell you it’s the pro line, it’s not something you’ll see professionals using. This is just as true of power tools as it is kitchen tools, by the way. It’s a funny thing, though. 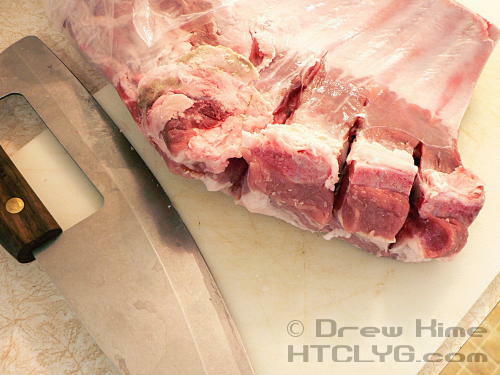 Sometimes professionals are using less expensive equipment than home cooks. If you go into the kitchen at a chain restaurant — the kind of place without celebrity chefs, where the management supplies the equipment — you’re likely to see stamped knives instead of forged. Sometimes with ugly white polypropylene handles. These high-volume kitchens are hard on people and equipment alike. So for the expensive stuff like mixers you want something way more durable than the home cook would ever need. But knives are — or can be — relatively cheap. You can keep a half-dozen spares in the closet, and just pull out a new one if you need it. The Lamsonsharp PRO line? This is the stuff you’re going to see in a restaurant kitchen. When you’re considering dropping a hundred dollars or more on a single knife, you should try to be honest with yourself. Do you really take care of knives the way you should? Do you hone them before each use? Do you never put them in the sink or dishwasher? Do you have them professionally sharpened every six months? If you do, then a high-end forged knife isn’t just a luxury. It’s a good investment. But if you’re a bit more casual with your cutlery, you might be better off with something more durable. 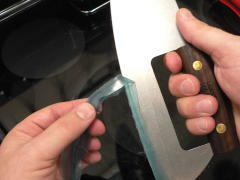 And that, finally, takes me to the Lamsonsharp PRO walnut handle chef knife. I guess there’s not a case to go with it, because it was shipped with just a silicone coating protecting the blade. Once I peeled it off, there’s no convenient way to store it. Looks like I need to get that magnetic knife holder sooner rather than later. 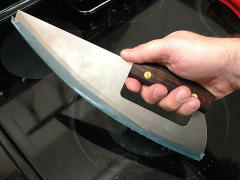 The overall length is about the same as my 8-inch chef knife, but the handle is above the blade instead of behind it. That means the cutting edge is significantly longer. The shape is also a bit different. 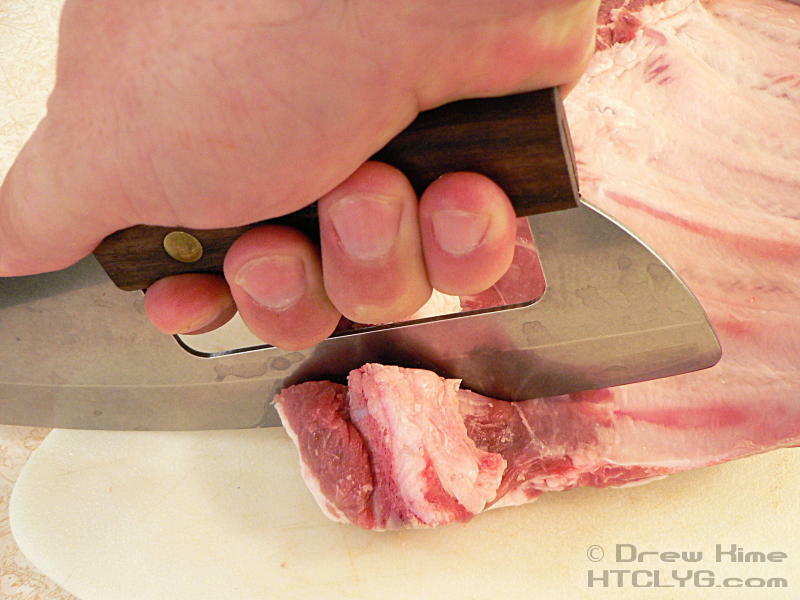 It’s more curved along its entire length, without the mostly-straight edge of a traditional knife. I don’t know if it’s more because of the placement of the handle, or the shape of the edge, but I felt awkward using it at first. I’ve been using the same basic style of knife for years, and using it has become automatic. This new shape has me thinking about what I’m doing and trying to reinvent the rules. One thing that’s surprisingly easier is chopping herbs. I know! 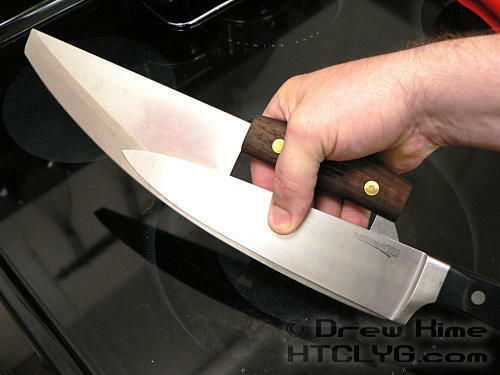 This huge knife for herbs? But it allows a nice rocking motion over a really large area. If you’ve got a lot of herbs to do, or garlic and onions, this makes quick work of them. Once you get the hang of the motion, that is. Then there’s the stuff you can do with this that you can’t do with your regular knife. I suspected that having my hand directly above the edge would let me do some cutting I normally wouldn’t be able to do. And wanted to give this thing a real test. 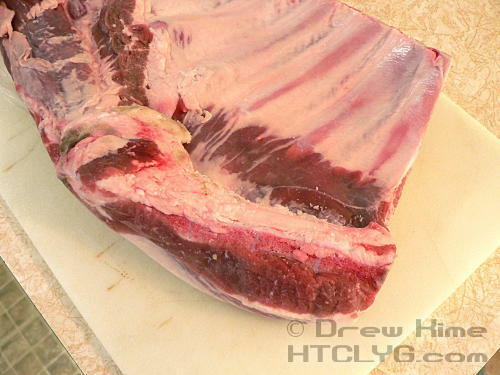 So I got a slab of ribs and asked them not to “crack the back”. 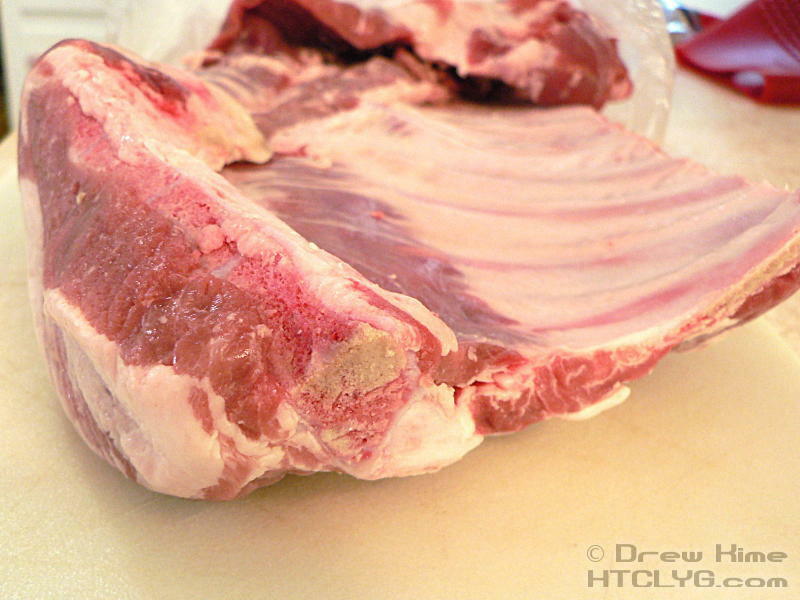 If you look from the edge of the rack, you can see a bone on the top-left that’s running crosswise to the ribs. They usually take a few shots at this with a cleaver in the back of the shop, before wrapping it up and sending it home with you. If they don’t, you end up with this huge bone across the end of the three or four largest ribs. I had to tell them three times that yes, I really did want them to leave it in one piece, so I could try out my new knife. Well how about that. You can see I’ve got a bit of a white-knuckle grip on it to keep it from falling over to the side, but it worked. It got a little harder as the bone got thicker, but I got through it every time with a bit of work. Next time I’ll let them do it for me, but it’s nice to know I’ve got the option if I need it. If you’re already good with a traditionally-shaped chef knife, you’re going to feel awkward at first using the Lamsonsharp PRO walnut handle chef knife. But with a bit of practice it can make quick work of dicing large quantities of aromatics. The size is also perfect for home-made pizza. It’s sturdy enough for cutting through bones and connective tissue.Â (I can’t wait to try it out on Thanksgiving.) And it’s durable enough to stand up to pretty severe abuse. For only $35, that’s a pretty good deal. If you want one, you can order it in my new store.